Virtually all arthropods (insects and their close relatives) serve as food (prey or host) for some other organism, such as predatory or parasitic insects, disease-causing microorganisms, birds, fish, and insect-eating mammals and plants. Insects and other organisms that use arthropods as a resource—resulting in their death, weakening, or reduced reproductive potential—are called natural enemies, biological control agents, biocontrols, or beneficials. In agricultural systems, the most common natural enemies are other insects and spiders. Natural enemies can help keep plant-feeding insects from attaining damaging population levels. It is important to understand how to manage agroecosystems to take advantage of the services of natural enemies. The intentional manipulation of natural enemies (either directly or indirectly) through manipulation of the environment to reduce pest populations or their damage is called biological control or biocontrol. Natural enemies can be generalists, consuming many types of prey, or specialists, with a much narrower host range. There are two general types of arthropods that are natural enemies: predators and parasitoids. Predators consume one or more living prey insects. Predatory behavior is widespread among arthropods (insects, spiders and mites). Some common predators in vegetable production systems are spiders, predatory mites, ground beetles, rove beetles, ladybird beetles, predatory bugs, lacewings, mantids, robber flies, and syrphid fly larvae. Figure 1. Predatory stink bug, Tethida barda, and prey. Photo credit: Steven Katovich, USDA Forest Service, Bugwood.org. Parasitoids live in or on the body of their host insect during at least part of their life cycle. Parasitoid is the term used to describe an insect that parasitizes and kills its insect host. Parasitoids that insert their eggs into a host's body are called endoparasitoids. Those that lay their eggs outside of the host's body, and whose larvae develop on the outside of the host's body, are called ectoparasitoids. Parasitoids that attack pest insects are called primary parasitoids. Parasitoids that attack other species of parasitoids are called hyperparasitoids. Usually the larval stage of the parasitoid is the parasitic life stage. The adult stage is typically free-living (not parasitic), and needs resources such as water, nectar, or pollen for survival. 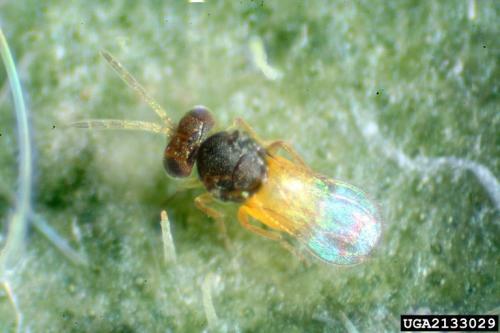 A typical female parasitoid searches for a host insect and, depending on the species, deposits one or more egg in or on the host. The eggs hatch and develop inside the host insect. 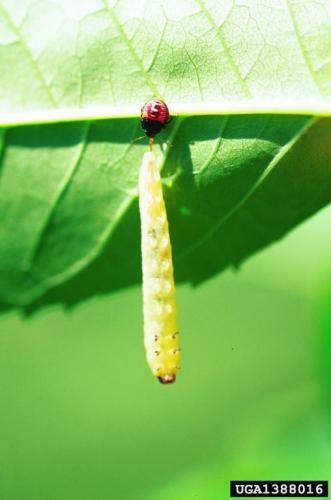 When parasitoid development is complete, the parasitic larvae emerge and pupate outside the host, or, in the case of many parasitoids, pupate inside the host insect and emerge as adults. Most parasitoids are in the wasp (Hymenoptera) and fly (Diptera) orders. There are a few species of beetles (Coleoptera) that parasitize other insects. The small group of twisted-wing parasites (order Strepsiptera), consists entirely of parasitoids. Figure 2. A whitefly parasitoid, Encarsia formosa. Photo credit: David Cappaert, Michigan State University, Bugwood.org. United States Department of Agriculture. 2000. National organic program: Final rule. Codified at 7 C.F.R., part 205. (Available online at: http://www.ecfr.gov/cgi-bin/text-idx?SID=a6a0935ddf00e166695f4c2138bd58d8&mc=true&node=pt7.3.205&rgn=div5) (verified 16 March 2010). Mahr, D. L., P. Whitaker, and N. M. Ridgway. 2008. Biological control of insects and mites: An introduction to beneficial natural enemies and their use in pest management. University of Wisconsin Cooperative Extension, No. A3842. Madison, Wi.